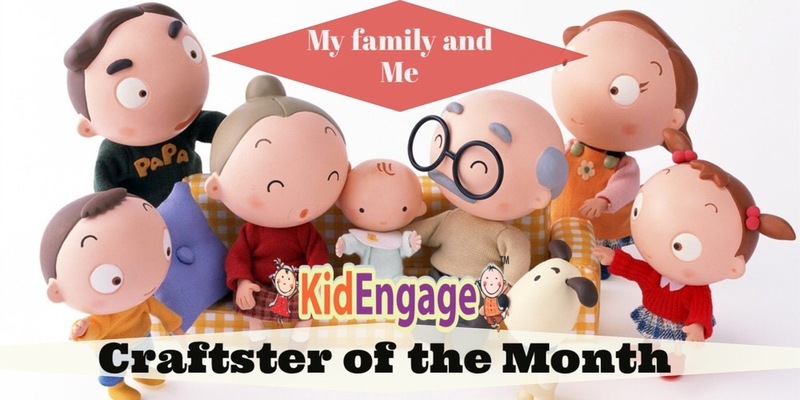 Craftster of the Month – My family and Me! Summer holidays is not just about your child’s time out from the daily routine of school. This is also the special time when families get together. Kids get to spend more time with their grand parents, aunts, uncles and ofcourse their cousins. Long hot days and warm nights also mean that kids will spend a lot of time indoors. And usually this translates into playing indoor games and creating crafts together. So, keeping this in mind we decided to have a ‘My family and me’ theme for our Craftster of the Month contest for the month of May! This month moms and kids have to send in entries for crafts that work around this theme! The winners will get to conduct a session of their crafting activity at the KidEngage centre in Manikonda and will be featured in a blog on our website and across all social media. – Your entries should only be based around the above mentioned theme. – The craft should be for the age group of 4-8 years. – The winners will be selected by our judging panel. – The winning session will take place on May7,2016. Previous The day the crayons had a conversation with the happy kids at Anthea Montessori School! Next The chocolicious event- Charlie and the Chocolate factory story with a chocolate making session!